A commemorative dawn service has been held at the Scottish National War Memorial in Edinburgh to mark the 100th anniversary of the Gallipoli landings during World War One. About 131,000 troops - some 45,000 Allied soldiers and 86,000 from Turkey - died during the campaign. The contribution of Scottish units was specially recognised. Wreaths were laid, with the service broadcast to members of the public on Edinburgh Castle esplanade. Gallipoli was one of the bloodiest campaigns of the war and the first to involve troops from Australia and New Zealand. The fatalities included about 25,000 British military personnel, 10,000 from France and 10,000 from Australia and New Zealand. First Minister Nicola Sturgeon and Secretary of State for Scotland Alistair Carmichael attended the service in Edinburgh. 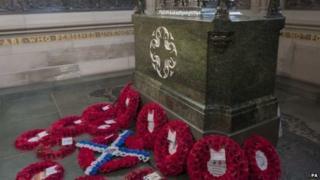 The event was organised by the The Royal British Legion Scotland and is part of the Legion's annual Anzac Day Service. It opened with a performance of 'And the Band Played Waltzing Matilda', written by Scottish folk singer Eric Bogle, and the Legion Scotland National Standards being marched across the castle drawbridge. Lt Col Roger Binks from the Scottish National War Memorial said: "There were many Scots regiments who were there and the Royal Navy and Royal Air Force, so it was very much a combined effort. "The 25th April is a particularly poignant day." Kevin Gray from the Royal British Legion Scotland told BBC Radio Scotland: "There were many, many Scots units involved in the Gallipoli campaign. "You had the King's Own Scottish Borderers who were part of the 29th division, and also the 32nd Lowland division, so they played their part fully, both in the initial stages of the campaign and later on as reinforcements. "You also had other units like the Royal Scots. They served in the 32nd Lowland Division. They, particularly, lost 214 officers and men in the Quintinshill rail disaster whilst deploying to Gallipoli." A series of events is taking place in Turkey to mark the 100th anniversary of the landings on the peninsula. On Friday, Prince Charles and Prince Harry met 15 relatives of Gallipoli veterans on board HMS Bulwark, the Royal Navy's flagship. Meanwhile the bravery of one particular Scottish seaman at Gallipoli was honoured in a ceremony in Bermuda. George Samson from Carnoustie was awarded the Victoria Cross for his actions during the landings. He was buried in Bermuda in 1923 after dying while serving on a merchant ship. A commemorative service in his honour was held at the military cemetery in St George's on Saturday evening. Anzac Day: Commemorate or celebrate?